Damian Mallard was once just another Sarasota personal injury attorney, struggling to compete in a cutthroat market. Now, he’s experiencing a level of success he didn’t know was possible. Before Damian signed with Foster Web Marketing, he hired an IT company that “did an irrelevant, static, unchanging website.” He knew that if he didn’t make a change, this mediocre website would be the death knell for his already struggling law firm. He knew his law firm had to stand out to compete, but he wasn’t sure how to go about getting the results he needed to build his brand and expand his practice. His “ah-ha moment” came when he saw Tom speaking at the GLM Summit. Tom’s message, “small law firms can compete with big, TV advertisers,” struck a chord with Damian, and he signed up for a new website. Since then, the Mallard Law Firm has experienced incredible success. But how exactly did the Mallard Law Firm go from knocking on death’s door to becoming the picture of health? We asked him, and his answers may very well change the way you look at attorney marketing. Damian understood from the beginning that if there was a remedy that could restore his firm’s vigor, brand building was it. As an attorney, you are selling yourself—and not just your legal services, but your expertise, your attitude, and your personality. Damian knew this, and to harness the power of a better brand, he successfully used two forceful brand building techniques: professionally written books and high-quality video. Both of these resources have been an excellent return on investment for his law firm. And while both cost more than generic, humdrum marketing materials, Damian insists that he quickly made up the initial cost of both. Damian had shot his own videos in the past, but they weren’t giving him the results he wanted. Knowing what a powerful conversion tool video can be, it was clear to him that he needed to step up his game. Many potential clients looking to hire a lawyer find that sitting down with an attorney is a stressful, intimidating moment. By allowing potential clients to “meet” you before they walk through your door, you take away some of their anxiety. This makes them more likely to call and schedule that all-important first appointment. And beyond shooting good video, Damian understands how to make the most of every video he makes. He not only embeds his videos on his site, he adds them to his YouTube Channel and promotes them on social media. One of his most popular videos, “How Long Does a Sarasota Personal Injury Case Take?” has over a thousand views—a pretty impressive number! For Damian, his ROI on the initial videos that Gearshift.TV produced for him was so good that he signed up for a video syndication plan. This means that Damian came in and shot multiple videos in one day. With this footage, Gearshift.TV produced multiple videos, optimizing them and setting them up to load once a week. And with a video strategy firmly in place and working so well, Damian knew that his next big project was adding free offers to his website. Damian credits his free offers for a lot of his success. Currently, Damian has four books on his site, and he has experienced tremendous success from all of them. 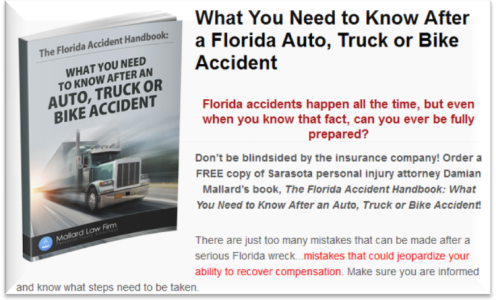 His most downloaded book, The Florida Accident Handbook, was written by our professional copywriters. And there is an additional benefit that Damian gets from his books. Not only does the book give potential clients answers to their most pressing questions, downloading the book automatically signs the reader up for his monthly newsletters. This keeps his name—his brand—in front of his audience, giving them something concrete to hold onto month after month. This creates a ripple effect that spreads his reach far beyond the moment the book was requested. It doesn’t matter how long Damian has been with us or what kind of relationship we’ve established. If he wasn’t getting results from his website he would cut ties and move on. “The results are what matter, and we get results,” Damian stressed. And now Damian is getting the results he demands. He has now realized his dream of running a highly successful, highly selective law firm. And while Damian’s market is exceedingly competitive, he’s able to not only compete with but beat out much bigger law firms. His secret to success? Picking the right marketing firm for his needs. We’d like to thank Damian for taking the time to speak with us. We are proud to have the Mallard Law Firm on our team, and couldn’t be happier to congratulate him as he builds his every-thriving practice. To learn more about what we can do to help your law firm go from surviving to thriving, call 888-886-0939 or register for our free monthly webinars where we go into detail about the topics that most affect the success of your law firm’s marketing plan. Think It’s Impossible to Get High-Quality Video on the Cheap? Think Again!